Video poker is one of the top gaming choices of many casino fans. The game is a great alternative to table game action and it offers a heads up gaming experience between a player and machine. Thanks to its popularity, there are many different variants of video poker. One popular variant is 10’s or Better. The variant is very similar to another video poker variant, namely Jacks or Better. The biggest difference is that in 10’s or Better you need to have at least a pair of 10s to receive a payout. Continue reading to learn more about the game and where to play it. To play the game with real money, make a deposit and place a wager. Then click on the Deal button. You will be dealt five cards and you should decide which ones to hold and which ones to discard. If you click on the Draw button you will get new cards and whether you are winner or not will depend on the newly dealt cards and the ones you have kept. After a winning hand you can choose to double your win by clicking on the Doubling option. In order to win, you have to make a pair of 10’s or better. The game is played with one deck of 52 playing cards and there are no wild cards. The cards are shuffled before each game. Doubling: 10s or Better has Doubling option. After a win, you can choose the option and five cards will appear on the screen. The first one is the dealer’s card and is dealt face up, while the other four face-down cards are yours. You choose one card and if it is of higher value than the dealer’s card, you will double your win. If not, you will walk away with nothing. Learn the game and practice skills in free mode before you switch to real money. Always discard pairs lower than Ten. Keep any Tens or higher if you don’t have a strong hand. Go for a royal flush instead of a straight or pair. Bet the maximum of five coins to have more chances of winning. 10’s or Better can be played at many online casinos like the reputable Joycasino powered by Microgaming. The casino is run by an experienced team of professionals and it has excellent security and customer support. The house edge of 10’s or Better at this casino is one of the lowest around (99.14%). US players that wish to play 10’s or Better can head over to the well-known Sun Palace Casino and enjoy high quality game play in 3D graphics. The casino is powered by Betsoft Gaming and it offers lucrative bonuses, fast transactions and reliable banking. 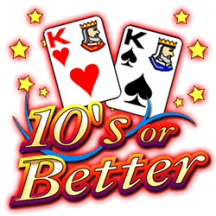 10’s or Better is a user-friendly variation of video poker designed for both beginners and advanced players. They can play the game without any trouble. The game is also easy to learn and fast to play. Once they learn the basics, players can easily hit the big wins. For a complete list of our reviewed and rated casino sites, make sure to read our reviews of online casinos.